This year we’re thinking about planting one right in the garden under a large viburnum with a carpet of moss that Eden transplanted last season.Have you planted a fairy garden? 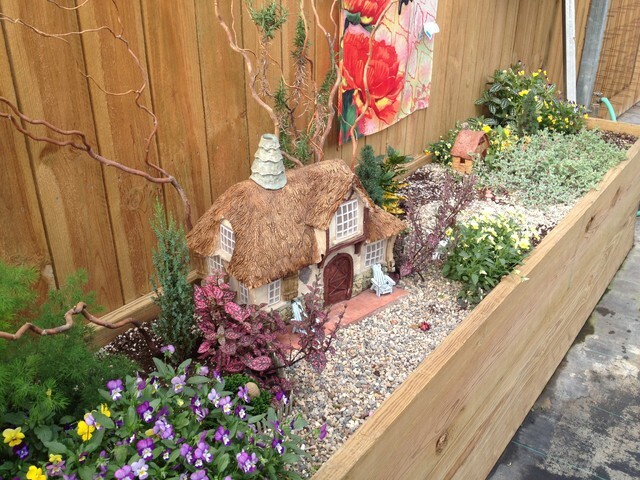 Share a picture in the Comments.More: Stumbling upon fairy houses in the Maine woodsGuerilla gardening in potholesDid elves make a home here? HOW TO CARE FOR YOUR YOUR MINI GARDENA garden made with so much love deserves more love all along the way. As small as they are, they require attention to tiny details, but are not at all difficult to look after if you keep in mind a few points as a part of their care regime.Make sure the potting soil you use is organic and free of any artificial fertilisers.Water the garden thoroughly once the plantation and landscaping is complete; thereafter gently water the container only when the soil feels dry.Prune the dry and damaged leaves and trim the trees as needed, treating these gardens like any other normal garden that evolves and grows with each passing day.Keep a vigilant eye on the plants to make sure they are free from bugs and diseases.Give them a soft sprinkle once in a while, delicately washing the leaves with your fingers. If you happen to lose any plant, don’t worry; just pull it out and plant a new one in the same spot.Loosen the soil in your container with a small trowel or a raking pin every few weeks to let the air circulate, keeping the root balls healthy.To get rid of the grime and algae that may grow on the accessories and design elements you are using in your garden, including the container itself, take them out and give them a gentle rinse with vinegar and water.Never let any dried-up leaves sit on the soil because they become hiding spots for pests and can harbour microbial infections, as well..And, most importantly, keep such gardens away from direct sunlight. Occasional placement in the sun is good, but let their permanent place be in an area of indirect sunlight.The gardening rules for summer and winter care are the same as for a normal garden. Soak in the sun on the patio of your home this winter, and relish the sight of the flourishing mini garden you have created, dipping your soul in an enchanting realm of beauty and peace.Read more:Little by Little: Why Growing a Bonsai Could Change Your LifeGarden Tour: A Mini Dino Park Designed for a 3-Year-OldTell us:Do you have a miniature garden? Share your pictures and gardening tips in Comments below. Playing outside with Elsie and fairy garden. This must have taken some time to make! This would make a cool little doll house style. Reminds me of Alice in Wonderland, too.